The big news of the week was the Red Sox signing of shortstop Stephen Drew. Drew began what should be a quick minor league stint this week with the Greenville Drive. In two games so far, Drew has gone 2 for 5 with a double and a run scored. With Drew signing back with the Red Sox, the order for the upcoming MLB draft became a little more clear. The draft will begin on June 5th, with the Red Sox slated to pick 26th overall in the first round. 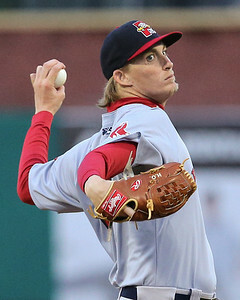 Henry Owens (pictured, above) hurled a gem in Saturday's 18-0 Sea Dogs blowout over the New Hampshire Fisher Cats (TOR). The 21 year-old left-hander tossed seven shutout innings, allowing just four hits and a walk while striking out six. Owens is now 5-3 with a 2.83 ERA and a league leading 63 strikeouts in 57 1/3 innings pitched. Kevin Thomas of the Portland Press Herald touches on Owens stellar start, but touches on how the left-hander is looking to cut down on the number of free passes he issues. 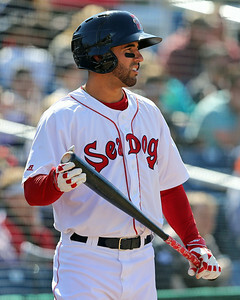 Thomas also touched base with Portland infielder Deven Marrero (pictured,below), who has impressed the organization and is still held in high regard as a shortstop despite Xander Bogaerts and Stephen Drew currently on the major league roster. This week's SoxProspects.com video of the week features SoxProspects #5 ranked prospect, Garin Cecchini. The PawSox third baseman has gotten off to a great start in 2014, hitting .290/.373/.348 with a home run and 18 RBI in 45 games. Mark Daniels of the Providence Journal recaps Allen Webster's start on Monday, showing flashes of brilliance while at times struggling with his control. The 24-year-old right-hander is 2-2 with a 3.02 ERA in 11 starts this season. He has struck out 43 and issued 25 walks in 59 2/3 innings. With Shane Victorino landing back on the disabled list, Daniel Nava was called back to Boston after 24 games in Pawtucket. Nava talked to MLB.com's Ian Browne about how difficult it was to go through a prolonged slump, and how happy he is to be back in the majors. In another roster move this week, Brandon Workman was called up to start on Saturday in placed of the injured Felix Doubront. Workman tossed five innings, allowing three runs on five hits and three walks against the Rays. Richard Breen of the Line Drive Blog checked in with infielder Jimmy Rider, speaking about his versatility and contributions since joining the Greenville Drive. The 24-year-old has hit .298/.417/.430 with a home run and 19 RBI in 36 games. Last week's SoxProspects.com players of the week were Justin Haley and Brandon Snyder. Haley won the accolades thanks to a stellar start against Carolina (CLE) on May 16th. Snyder claimed the award after an impressive week that saw him collect eight hits in 17 at-bats, including three home runs and six RBI. It wouldn't be a Weekly Notes column with a mention of Mookie Betts. The Boston Herald's Michael Silverman discussed the super prospect's new position with Red Sox Farm Director Mike Hazen and Sea Dogs hitting coach Rich Gedman. In an interesting note, the Chicago Cubs signed former Red Sox outfielder Manny Ramirez to a minor league deal as a player/coach for Triple-A Iowa. Photo Credit: Mookie Betts and Henry Ramos by Kelly O'Connor. John Gray is a Staff Writer for SoxProspects.com. Follow him on Twitter here.